This is another email I sent from the Sports Bar in the China Hotel when we were in the People’s Republic of China to adopt our oldest daughter. The time and date say it was at 12:43 AM on September 15, 2002, which means it was mid-morning on September 14 here on the west coast in the States. This was the day we arrived back in Guangzhou after a six-day tour or Beijing. We were still childless, but were flying the next day to Nanning, where we would have Aimee placed in our arms in a small conference room at the Majestic Hotel. I sent this email to one of the moderators of the Yahoo Group we had joined, which was created for people adopting through the organization U.S. China Affairs (USAA). The Internet in China was pretty squirrelly back then and there was no access in hotel rooms, nor was there such a thing as a smartphone (at least not one that was widely available as a consumer item), so I would have to trudge down to the lobby and this small bar, where there was at least one (don’t remember otherwise) computer I could use for a little while. I was writing mostly for those who had yet to travel. The wait for us had been nearly two years. For others, it would soon get longer, though we didn’t know that at the time. I knew people were hungry for status whenever a group traveled, so I filled that void for a while. 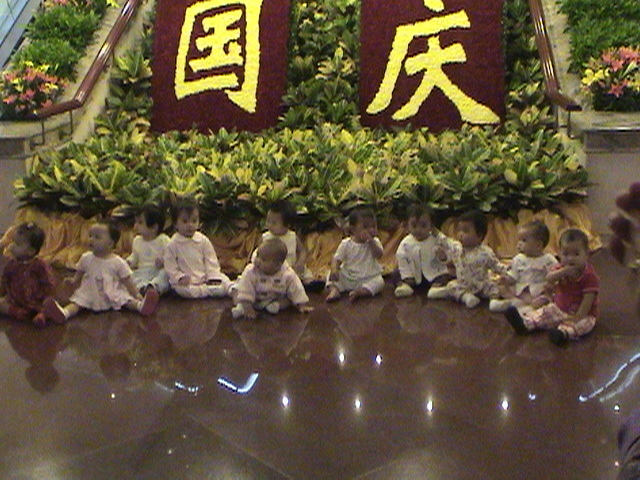 In the lobby of the China Hotel, in Guangzhou, some of the 33 children – all girls but one, and a set of twins – adopted by 32 families in our travel group in September 2002. That’s Foosh on the far right, in the red top. I reiterate. I am posting these in part so my daughters will someday be able to read them and fill in another blank, when they’re ready. They both know they’re adopted and are aware of everything we know (which isn’t all that much) about their lives before they joined our family, but these emails I’m posting run the gamut from mostly informational to fairly emotional and, perhaps, introspective. They’re not ready for that kind of conversation yet. Hopefully, these memories will be available online for them. I could just print them out but I want them to be on my blog as well. Otherwise, why do I have this thing? We’re now in Guangzhou, and I’m in the Sports Bar in the China Hotel. Still can’t access groups, period; not just China33. My interest was more in reading just to see what was going on, but if no one else is communicating with you guys, this email can serve to let you know what’s going on. We’re finally all here; had brunch this morning at a wonderful restaurant which appeared (from the outside) to be located below a sports stadium, and Norman introduced the China team and told us what would be going on. The groups then split into two – one for the folks remaining in Guangzhou to go shopping, and the other for the folks who will be traveling tomorrow to get 70 minute foot massages for 80 RMB. Norman says they are top drawer and include all you can eat and drink. As for myself, I chose to come back to the hotel and relieve myself of a large amount of cash I’ve been carrying around and which Sara was more than happy to take off my hands. I also wanted to get in what I suspect will be some of the last reading I’m going to get for a while. Tomorrow, Linda and I travel with about 10 other families to Nanning, where we will perform a multiple gotcha at the hotel in the evening. I’d like to say I’m excited, but I don’t believe that word comes close to conveying the range of emotions I’m experiencing right now. No matter how hard I try to imagine what it’s going to be like for this 55 year old, childless man to shift gears – in an instant – so dramatically, I find it impossible to do so. I have chosen to put my faith in my lifelong love of children, my experience with my sister, who is 19 years my junior, and the knowledge that lesser men than me have risen to the challenge, to carry me through. Frankly, I’m not that worried, though perhaps that means I haven’t fully grasped the enormity of the situation. As for Linda, I can only say she has strong maternal instincts and I’m sure she’ll do fine. Besides, she knows I sleep a lot less than she does, so she’s got a mule in the stable. Well, that’s it for now. Feel free to post this message, either in its entirety, or edited as you see fit, for the rest of the family on China33. When we come back from Nanning, no doubt the serious shopping will commence. I will inform you of our progress on the dresses. Take care. This entry was posted on Sunday, October 18th, 2015 at 9:42 am	and posted in Adoption, Family, History, Personal. You can follow any responses to this entry through the RSS 2.0 feed. « Goodbye Old Friend. It Was Great.